Diagnostic Imaging Category Archives — Health Law Attorney Blog Published by Health Care Lawyers — The Health Law Partners, P.C. The Office of Inspector General (“OIG”) recently released a report entitled Questionable Billing Patterns of Portable X-Ray Suppliers (“Report”) wherein it identified portable x-ray suppliers with billing patterns associated with inappropriate Medicare payments. As a result of its Report, the OIG made recommendations to the Centers for Medicare and Medicaid Services (“CMS”) to account for inefficiencies in its reimbursement of portable x-ray suppliers. 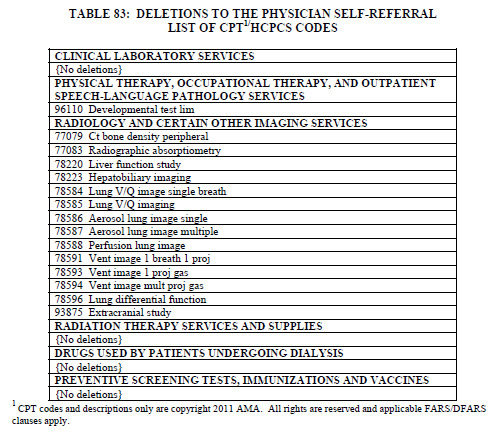 § 486.106 Condition for coverage: Referral for service and preservation of records. All portable X-ray services performed for Medicare beneficiaries are ordered by a doctor of medicine or doctor of osteopathy and records are properly preserved. (1)	The X-ray test was ordered by a licensed doctor of medicine or doctor of osteopathy, and (2)	Such physician’s written, signed order specifies the reason an X-ray test is required, the area of the body to be exposed, the number of radiographs to be obtained, and the views needed; it also includes a statement concerning the condition of the patient which indicates why portable X-ray services are necessary. (b)	Standard–records of examinations performed. The supplier makes for each patient a record of the date of the X-ray examination, the name of the patient, a description of the procedures ordered and performed, the referring physician, the operator(s) of the portable X-ray equipment who performed the examination, the physician to whom the radiograph was sent, and the date it was sent. (c)	Standard–preservation of records. Such reports are maintained for a period of at least 2 years, or for the period of time required by State law for such records (as distinguished from requirements as to the radiograph itself), whichever is longer. 3. Technical Component – Administering the test, and 4. Professional Component – Interpreting the results. According to the Report, “[e]ighty percent of the amount Medicare paid to portable suppliers in 2009 reimbursed them for transporting and setting up the x-ray equipment.” When reimbursing for the Transportation Component, Medicare pays for the full Transportation Component once per each trip to a particular location. Therefore, if a supplier is furnishing x-ray services to three beneficiaries at one nursing home, on one trip, it will pay 1/3 of the Transportation Component for each beneficiary (totaling one full Transportation Component). On the other hand, if a supplier furnishes x-ray services to three beneficiaries at one nursing home on three separate trips, on the same day, Medicare will pay for the full Transportation Component for each return trip to a facility on a particular day. •	Collect the $6.6 million in overpayments for portable x-ray services rendered in 2009 that were ordered by nonphysicians; and •	Implement procedures to ensure that CMS pays for portable x-ray services only when ordered by a physician and establish appropriate controls. CMS concurred with the OIG’s recommendations and has taken action to address its reimbursement processes as they relate to portable x-ray suppliers. Portable x-ray suppliers should continue to monitor and assess their billing practices and claims submission to ensure compliance with the applicable laws and regulations. A Florida radiology clinic, Midtown Imaging LLC, and its former owners–Midtown Imaging PA and PBC Medical Imaging–have agreed to pay $3 million to settle allegations that Midtown Imaging LLC submitted false claims to Medicare between 2000 and 2008. The allegations arose from Midtown Imaging LLC’s lease and professional services agreements with referral sources that were in violation of the Anti-Kickback Statute (AKS) and Stark Law (Stark), according to a Department of Justice press release. The whistleblowers, Dr. Teresa M. Cortinas and Dr. Walter E. Wojcicki, will receive $600,000. Since January 2009, the Justice Department has recovered over $7.3 billion in False Claims Act cases. • Sustainable Growth Rate (“SGR”) – The SGR is an annual growth rate that applies to physicians’ services paid by Medicare. According to the Fee Schedule, by January 1, 2011, the SGR for physicians will be cut by a total of 24.9%–once on December 1, 2010 and once on January 1, 2011. 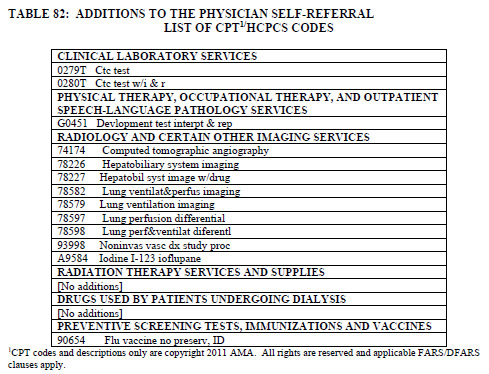 This SGR cut has been anticipated for physicians as it was to be in effect in June of 2010. • Annual Wellness Visit (“AWV”) – Beginning January 1, 2011, Medicare will reimburse physicians for performing an AWV. An AWV takes into account a health risk assessment and creates a personalized prevention plan for beneficiaries. Certain elements must be identified in the beneficiary’s first visit that include: establishing or updating the beneficiary’s family and medical history, a list of the individual’s current providers and suppliers and medications prescribed, height, weight, and body-mass index, blood pressure, detection of any cognitive impairment, establishing a screening schedule for the next 5-10 years, establishing a list of risk actors and conditions for which interventions are recommended or underway, furnishing personalized health advice and referral to health education or preventive counseling services or programs. • Elimination of Deductible and Coinsurance for most Preventive Services – Beginning January 1, 2011, the Part B deductible and 20% coinsurance will be waived for preventive services that have been either “strongly recommended” or “recommended” by the US Preventive Services Task Force. 2. For whom primary care services accounted for at least 60% of the allowed charges under Part B for the practitioner in a prior period as determined by the Secretary. Primary care services are defined as those services identified by the HCPCS codes of 99201-99215, 99304-99340, and 99341-99350. The incentive payments will be made on a quarterly basis based on the primary care services furnished and any other physician bonus payments for services that are furnished in Health Professional Shortage Areas. • In Office Ancillary Services – for MRI, CT, and PET scans, physicians must disclose to patients, in writing, at the time of the referral that a patient may obtain the services from another provider. At the time of the referral, the referring physician must provide the patient with a list of five alternative suppliers (who supply the same service) within a 25-mile radius of the physician’s office location (please check back for a more detailed entry regarding this change). • Modification of Multiple Procedure Payment Policy for Advanced Imaging Services – Effective January 1, 2011, CMS will reduce the payment rates for procedures associated with expensive diagnostic equipment assigning a 75% equipment utilization rate assumption to expensive diagnostic imaging equipment used in CT and MRI services. 4.CMS or one of its contractors determines that the failure to meet the 12-month deadline was because, at the time the service was furnished, the beneficiary was enrolled, and subsequently disenrolled, in a Medicare Advantage plan or a PACE provider organization and the Medicare Advantage plan or PACE provider organization recovered its payment for the furnished service 6 months or more after the service was furnished. The final rule will appear in the November 29, 2010 Federal Register. Except as otherwise specified, the policies and payment rates adopted in the final rule will be effective for services furnished on or after January 1, 2011. As is evident from these select provisions from the Fee Schedule (oftentimes driven by the provisions in the Affordable Care Act), physicians’ reimbursement for services rendered to Medicare beneficiaries is becoming increasingly more difficult for physicians to receive, especially with the significant decrease in the SGR. If the decrease in SGR is not postponed (or even eliminated), senior citizens will experience difficulty in accessing medical care–one of the evils the Affordable Care Act sought to address. The OIG will review the high-cost diagnostic tests to ensure that they were medically necessary by looking at the same diagnostic tests ordered by the primary care physician as well as the specialist. With respect to independent diagnostic testing facilities (IDTFs), federal regulations require compliance with 17 standards. The OIG will look at IDTFs to ensure compliance with all standards in addition to identifying billing patterns of non-compliant IDTFs.